This is the bathroom as we found it. 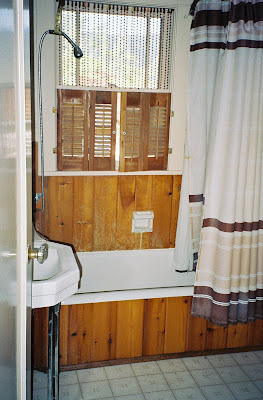 As you can see, it was a marvelous example of the 1970's era with the classic assembly of beads, wood paneling, linoleum and to tie it all together, one homemade metal doo-dad to hold the shower nozzle in its place. Being quite green around the ears, we actually looked at this at the time and thought...just take down beads, ...pull off wood paneling, ...replace toilet, ...add a few coats of paint...easy. Well, as you can see there was a bit more to it than that. 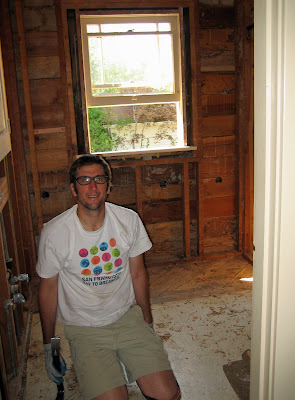 Here is sweetie pie in our newly gutted bathroom taking the last row of microscopic staples out of the last layer (of which they were three) of flooring. And those are safety goggles that he's wearing - kind of retro huh? Note: Safety goggles and HEPA face masks became a part of our facial features. And when we weren't wearing the masks - like for instance during the small amount of time we weren't working on the house (sleeping hours), we had long mask divots running down our faces (it took hours for them to fade). The divots made hubby look more rugged and handsome. They just made me look old. 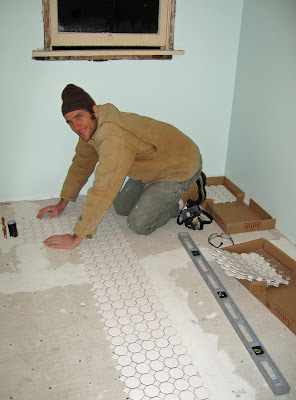 Fast forward past electrical, insulation, drywall, paint and here we are with hubby installing new floor tile. As you can see he is wearing a winter coat and hat inside. 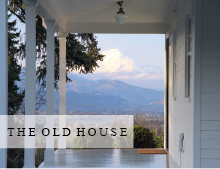 That's because we hadn't yet turned on the heat because we were living up in the guest house. Layout stayed the same but with new bathtub, sink and toilet. Shutters are from Horizon Shutters. Medicine cabinet is the only original piece left of old bathroom. Reproduction cross handle faucets from Rejuventation. Go here to see full post. is that a vintage embroidered handtowel? it looks so cute! perfect with the gorgeous bathroom. you have such a good eye for design (and such a handy husband!). I just love all the bedrooms, everything. I'll quit bothering you now! I adore all of the details in this room, so fun to look at the before and afters together. Great job! Please tell me the color of your bathroom. It looks very similar to my bedroom color. 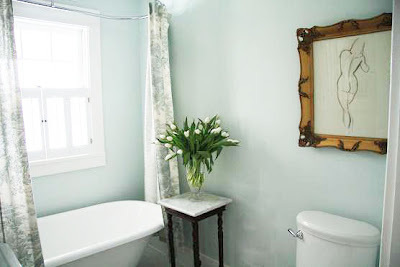 Is it Quiet Moments from Benjamin Moore? Your bathroom is just beautiful!!! It's Opal Essence by Benjamin Moore. I also used it in the guest room...I just loved it and tried several colors before I found this one. Oh, my! This bathroom is BEAUTIFUL! What a transformation! Great job! 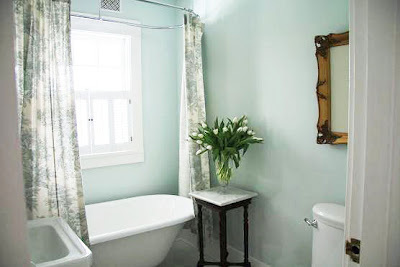 What a beautiful bathroom, it's so light, bright and I love the more classical fixtures. Just now looking at this post! Wonderful redo! Love the pedestal sink...new piece? Nothing like a handy husband! Lucky you! hi, i love the changes you made, so fresh and simple. 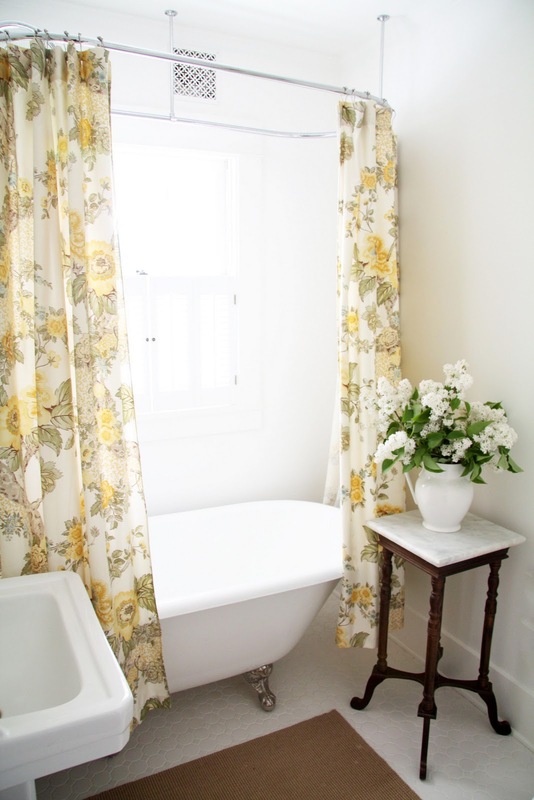 where can i buy those rods you used for the tub curtains?